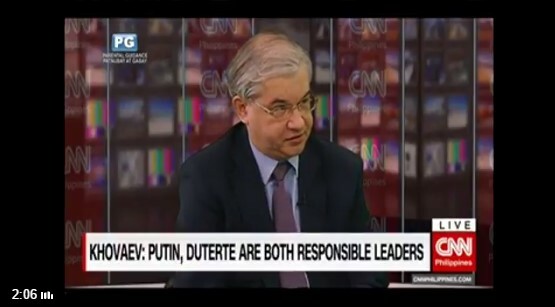 Russian Ambassador to the Philippines Igor Khovaev says Russia is ready to support the Philippines. "Any kind of support, it depends on you. It depends on our Philippine partners." 1. Putin radically changed his itinerary when Duterte decided to fly back to Philippines when Maute-ISIS attacked Marawi. 2. Putin had to take a 3-hour flight to meet Duterte. 3. Putin and Duterte talked for almost two hours on details of various agreements. 4. The conversation tone was serious and the ambassador felt chemistry between strong leaders.